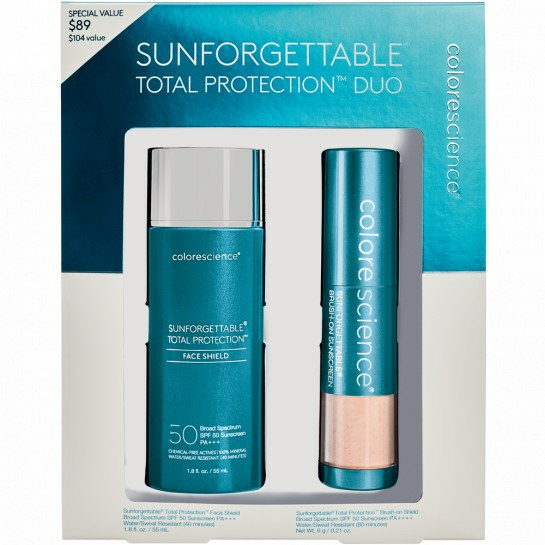 Save $15 with the new Sunforgettable® Total Protection™ Duo Kit SPF 50. Featuring our Face and Brush-On Shield formulas, this duo kit provides complete environmental protection from UVA/UVB, pollution, blue light, and infrared radiation. The Duo Kit includes a medium shade brush but if you need a different shade, simply click the button below, to activate a custom Duo Kit discount. You must add your desired Brush-on Shield shade and a Face Shield to your shopping bag in order to receive an automatic $15 savings. Face Shield: Shake well before use. Apply liberally and evenly to face, neck, and décolleté. Brush-on Shield: Apply generously and evenly in a circular motion onto moisturized skin prior to exposure to environmental stressors. Reapply at least every two hours. Great deal on a great combination of products. Work well alone however they work better together. Great deal on a great combination of products. Work well alone, however, they work better together. This was my purchase with Colorescience and I am very satisfied with it. 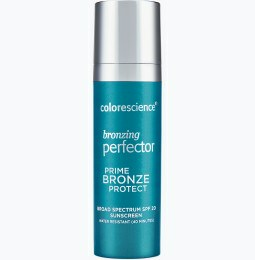 Since then I have also ordered the eye corrector SPF 35, bronzer and reordered the face shield. I hardly wear makeup and wearing SPF is my defense against anti-aging. The tint is universal and light. Best of all tinted sunscreens have Iron Oxide. 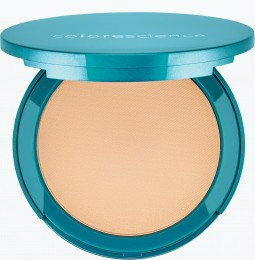 The Brush-on Shield works great to diminish shine while it adds an extra layer of SPF protection. 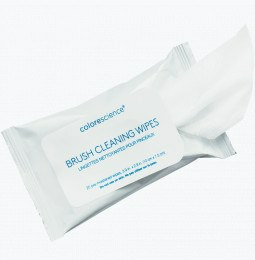 For those who wear makeup daily, the brush-on applicator won't ruin your makeup. Save some money and purchase together. Great protection for your skin. These are 2 of my go to products and bundling them is perfect. So I never knew why my skin always broke out when I used SPF face products and then I found out about chemical sunscreens etc and all of a sudden everything changed for me. A friend recommended this product (her dermatologist recommended it to her). I bought this set as my introduction to the product. I love it. I am only giving four stars because the kit only seems to come in medium, which I didn't realize when I initially purchased it (for some reason I thought it would be neutral or some how magically for all skin tones...) so it doesn't "perfectly" match my skin. It matches ok because its not a super pigmented coverage so I don't mind too much. I purchased this set and am loving the liquid faceshield. It makes my face look so healthy and naturally perfected. 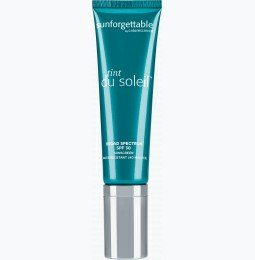 I own many high end “tinted” mineral sunscreens in the same price range and a few even in a higher range, but by far, I find the Colorscience to be the best suited for my needs. While I am also loving the look of the brush-on powder sunscreen on my skin, I am finding it difficult to get the powder to come out. It spits out a small amount of puff in the air, and then it stops delivering. I took it with me on vacation to Kauai, but plan on contacting customer service when I return. I also apply it by closing my eyes and then pat/press it into my skin because I find that it stings and irritates my eyes. To be fair, I have very sensitive eyes. I have absolutely no issues applying the liquid near and around my eyes. All in all, I’d definitely repurchase the Facehield liquid again and again. While I appreciate the convenience of reapplication of the brush-on powder, the eye stinging might be of further issue. I own several items from this line and look forward to trying other products out. love it, perfect for the summer, highly recommend it!